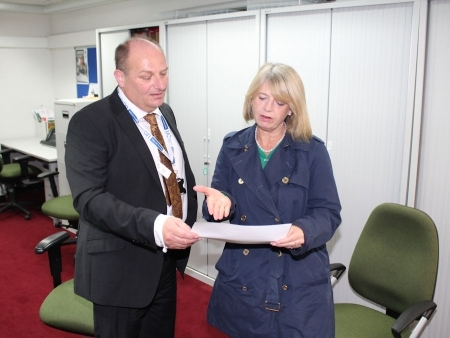 West Worcestershire MP Harriett Baldwin popped into Malvern’s Job Centre to talk to staff about the progress rolling out the new Universal Credit benefit. The MP chatted to staff about the roll-out and offered her help to people who are experiencing problems as they move over to the new system. The Budget confirmed extra measures to help the transition to the new benefit, including £1.7 billion to increase existing work allowances in Universal Credit, making work even more rewarding. Harriett commented: “There has been a lot of publicity about the roll out of Universal Credit and I was keen to talk to the local team at the Job Centre in Malvern Library and to make sure that we get the best feedback to pass to the Department for Work and Pensions. “The consensus it is a much fairer system and that the roll out is working smoothly. The Job Centre team has agreed to keep me closely informed in case any issues arise. “The Government has listened to feedback to make sure that people transitioning to Universal Credit can access emergency funds if needed. My office is working closely with the local team to help where required and I want to thank the local Job Centre staff for their hard work through this process.